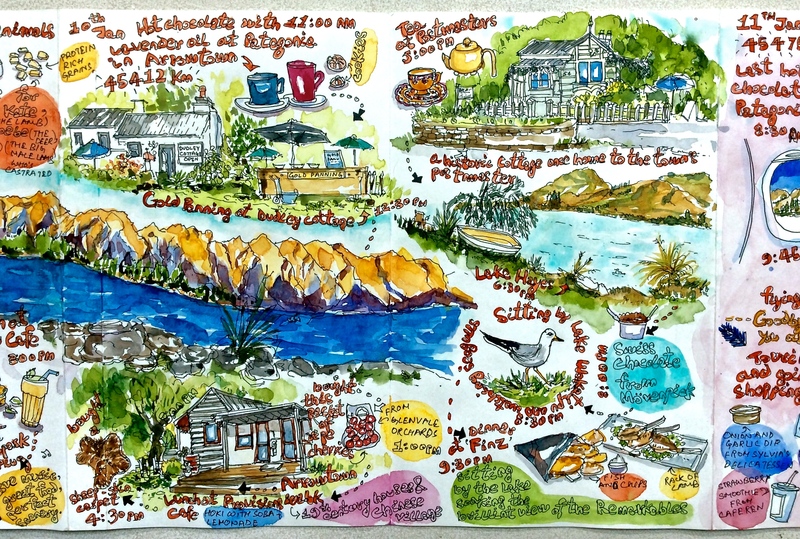 7th January 2015 : The Southern Scenic Route – There were several detractors of the ‘Southern Scenic Route’ that starts from the heritage town of Dunedin following the southern coast to Invercargill via the Catlins and continuing west to our final destination – Te Anau. ‘There’s nothing much to see on this route’; ‘it’s a waste of time’; ‘you should rather opt for a 3 hrs non stop drive to Queenstown’ and so on, is what we heard all along. Truth be told, only because we had driven on the Inland Scenic Route with fabulous views of the Canterbury Plains and the surreal Southern Alps , this part of the journey paled in comparison. But not without a few surprises. 7th Jan / Southern Scenic Route – After accounting for the places we wanted to stop along this route : Dunedin – Milton – Kaka Point- Nugget Point – Owaka – Purakanui Falls – Papatowai – Curio Bay – Invercargill – Colac Bay – Lake Manapouri – Te Anau, it was clear that we were in for a long drive, about 8 to 10 hours long. Like Nugget Point, with its solitary lighthouse dominating a jagged peak on the Catlins coast. It feels like a place you may see in your dreams and have a lingering memory of when you wake up. As you climb up the steep headland with a 200 feet drop on the left, the wind howls in your ears, shuffling through your hair and clothes. The brooding grey sky hangs above. And the ocean, somnolent at a distance is broken into indignant froth by the nugget like rocky islets scattered below. Fur seals and sea lions laze on the rocks, undisturbed. 7th Jan / Southern Scenic Route – The three tiered Purakaunui Falls was tucked in a soft mossy green aura ; Curio Bay showed us three hector dolphins and Invercargill was only good for a cup of coffee and döner kebab. Note the signage near the Llama farm in Manapouri! It was near the spectacular Lake Manapouri that we stopped by a llama farm and I sketched the one remaining llama that didn’t flee as I approached the barbed wire fencing. At Te Anau, we checked into a refurbished cathedral working as a B&B and after a freezing stroll along the lake, we ended the day in Mother Superior’s room. January 2015 : Day trip to Milford Sound – If there’s something in this world that holds the power to transform and transcend, it is nature. I’ve felt that numerous times while driving through New Zealand, across varied landscapes but never did I feel it so strongly as I did on that ferry sailing through the fiord, past lush rainforest covered sheer rock faces, rising from the water like giant mythical creatures, their peaks hidden behind a thick veil of mist. We were on the 2.5 hours Milford Sound nature cruise with Real Journeys that started at 1:30pm. As per the brochure, a million people visit what Rudyard Kipling called the 8th wonder of the world. The anticipation was high. 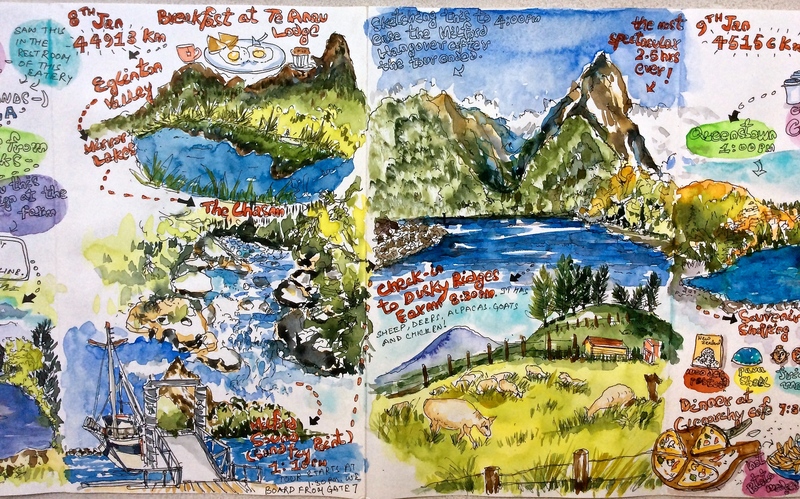 8th Jan / MIlford Sound – As the end of the Milford Sound cruise, I became a sad, mumbling mush. I called it the Milford Hangover – a mixture of awe and humility. It was hard for my husband to drag me away because I kept looking back for ‘one last view’. In the evening we checked into Dusky Ridges, a working farm in Te Anau, amid rolling fields, distant mountains and pine trees. Next morning, Win, the kiwi owner let us feed goats, chicken, deer and alpacas! The deeper we trudged into the fiord, more windy and mystical it became, with the boat bobbing with the waves and spraying water on the deck. We were soaking wet, fighting the howling gale, holding on to the mast, stupefied with the outlandish beauty. Just as we were sailing back to shore, Mitre Peak dusted itself off the clouds and appeared in full regalia. The captain killed the engine and said, “This isn’t something we see every day. You’re very lucky”. He wasn’t talking about the snow capped peak. A school of dolphins were joyously swimming past the boat, some jumping in the water in perfect arches. 9th January 2015 : Te Anau to Queenstown – The sight of the mighty Remarkables signalled the arrival of Queenstown which was living up to its hype of the adventure capital of New Zealand. A casual stroll through the streets took us past a string of shops retailing bungee jumping, jetboating, rafting, sky diving offers plus a host of another selling appropriate gears for engaging in these high adrenaline sports. 9th Jan / Queenstown – While I was sketching the Remarkables, a lady few hundred metres away from me, perched on a projecting rock, was reciting a verse in English, out loud with intense conviction and in a quick tempo. It was very powerful, especially during that time of the evening. I had goosebumps. High end hotels, mid range apartments, low range hostels, backpacker joints, all kinds eateries and their purveyors were crammed in every corner of Queensland, strolling, driving, sunbathing, swimming, photographing, souvenir shopping, hiking, clubbing and what not. It was the most touristy spot I’d come across in the entire South Island. Forty five minutes drive to Glenorchy with spectacular views of Lake Wakatipu against sheer mountains and an electric blue sky, was the perfect antidote to boisterous Queenstown. We spent the evening at Glenorchy Cafe listening to live music in its backyard and watched the sun set behind the mountains. 10th January 2015 : Day Trip to Arrowtown – Arrowtown looks like a film set for a period drama, too quaint to be real at times. The tree lined 19th century cottages and historic wooden buildings have played their part in the 1850s Gold Rush, and now pull their weight by housing museums, restaurants, real estate agency, cafes, bars and shops selling sheep skin carpets, sweaters, vintage decorative items, souvenirs and so on. There’s a meditative silence interrupted by bird cries and the constant drone of visitors who are here to collectively travel back in time. To savour this anachronism some more, we have coffee at Postmasters – a historic cottage which was once the home of the postmaster. 10th Jan / Arrowtown – I tried Gold Panning at Dudley Cottage for 10 dollars and got a certificate and vial containing my find! ‘Success was guaranteed” though! On the way back to Queenstown, we stop at Lake Hayes. The 100th annual Lake Hayes agricultural and pastoral show was wrapping up for the day – the horses, sheep were led to the cattle trucks, the organisers resting their legs on chairs, drinking beer, the makeshift structures being dismantled, the dust from the festivities finally settling. From a private nook along the lake we watch the purple sunset. The melancholy of the the last night in New Zealand was fast approaching. 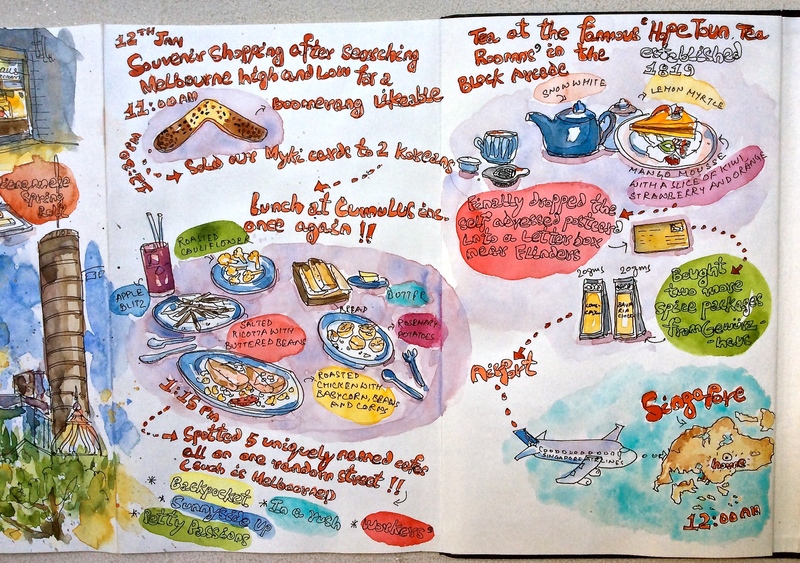 11th January 2015 : Queenstown to Melbourne – Thank God for an extra day in Melbourne, because QVM was fantastic! It was in the deli section where my pulse quickened. Extensive range of cheese, marinated olives, cured sausages, dips, pates dazzled in their marble counters. Bakeries, patisseries, spice shops, wine sellers, chocolatiers, coffee and tea merchants got me absolutely berserk. You can gauge my excitement from the shopping I did there in the short amount of time. Everything got sketched, of course! 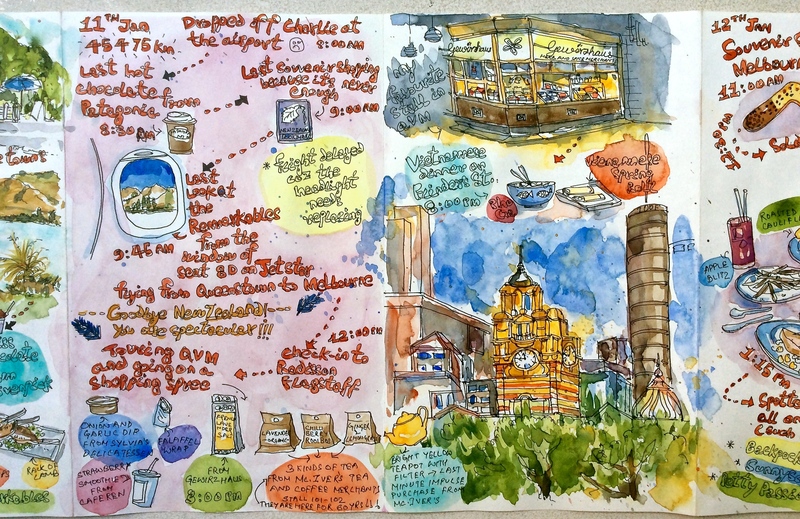 11th Jan / Melbourne – Gewürzhaus (the top right sketch) was my favourite shop in QVM. I bought a pack of French Lavender salt from them. Also, their salted caramel candy is finger-licking good! 12th January 2015 : Melbourne to Singapore – The last day was spent in revisiting some favourite spots like Cumulus Inc – pigging out on yet another plate of roasted cauliflower and buying more spices from Gewürzhaus. We sealed the trip on a victorian note, sipping ‘snow white’ from dainty white cups in HopeToun Tea Rooms, a 19th century tea parlour in Block Arcade. 12th Jan / Melbourne – The Two Korean guys who bought our Myki Card were students from Brisbane. They asked me if we were on our honeymoon! 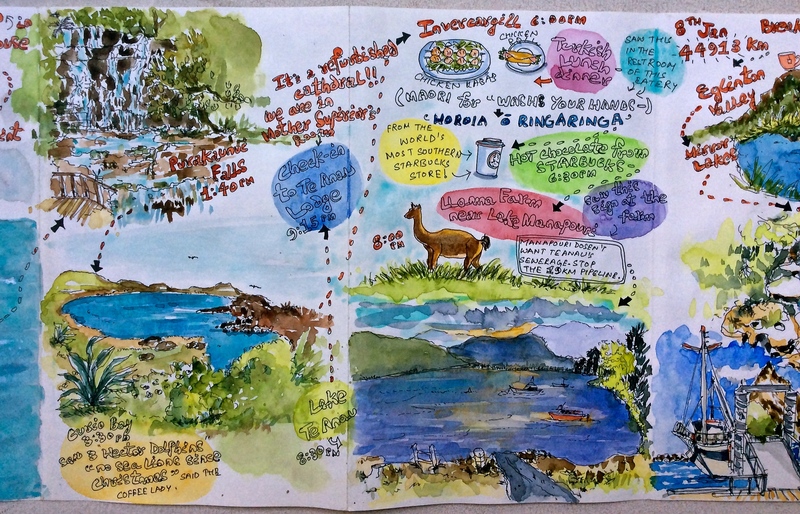 Above is the 49th as well as the last page of my journal that records a fabulous 18 day trip to the Antipodes. 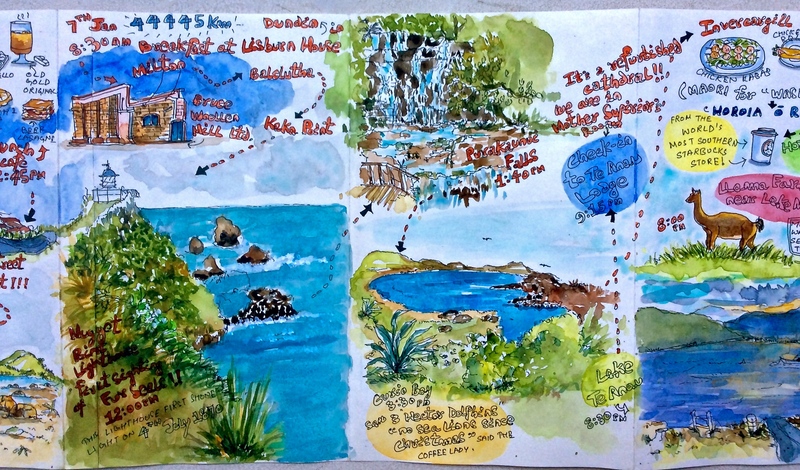 Sketching a journey so extensively has been a revelation! Apart from the sense of joy in putting pen to paper everyday and creating something from nothing, it became a practice in self-discipline and mindfulness. When I started the first page, listing the items packed in my backpack, I did not expect it to evolve into what it is now – a tactile treasure trove of memories. 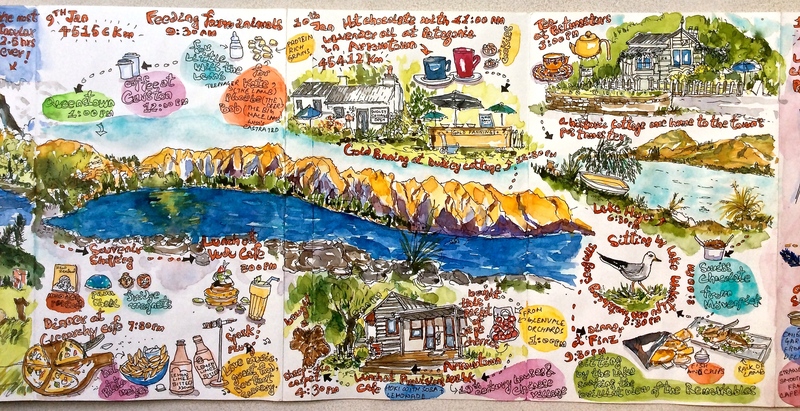 This entry was posted in Daily Vignettes, Travel Vignettes and tagged 100th annual Lake Hayes A & P show, 8th wonder, Arrowtown, Block Arcade, Canterbury, Curio Bay, deli, dolphins, Dudley Cottage, Dunedin, Dusky Ridges, Eglinton Valley, Gewürzhaus, Glenorchy, gold panning, Hopetoun Tea Rooms, Inland Scenic Route, Invercargill, Kaka Point, Lake Hayes, Lake Tekapo Lodge, Lake Wakatipu, llama, Manapouri, McIvers Coffee and Tea Merchants, Milford Sound, Mirror Lakes, Mitre Peak, Mother Superior, Myki card, Nugget Point, Paua shell, Postmasters, Purakaunui Falls, QVM, Remarkables, Rudyard Kipling, Sandfly Point, Southern Scenic Route, Te Anau on March 4, 2015 by Somali Roy.